Navigating the sea of applications that our smartphones and tablets are awash in can be like finding your way out of a maze, at times. We’re here to help you out of the labyrinth with our guide to WhatsApp Messenger. Even a brief glance at your mobile device’s app store will show you that we’re not spoiled for choice when it comes to picking out an application for messaging and communication. Kik, Facebook Messenger, Trillian, Snapchat, WhatsApp and more all regularly make the “most downloaded” lists, which can make the process of selecting one turn into a headache for the average consumer. Often, since they’re all free to download, users simply end up downloading all of them, which results in a cluttered and cramped smartphone that’s constantly bogged down by unwanted push notifications and updates to apps that you never even use. Let’s cast away the clutter and talk about WhatsApp, a gold-standard communications app that has weathered the storms of years of development and emerged as a reliable messaging resource. It doesn’t have the flash of youth-popular apps like Snapchat or Kik, but speaking from my own experience, that’s not exactly what a person is always looking for. Sometimes, it’s nice to do away with all of the flair and glamorous graphics. Instead, we want a multi-platform messaging service that’s lightning quick, support video calling, and lets us access our messaging and contacts from our PC whenever we’d like. If that description suits your needs, then read on. There’s a good chance that WhatsApp Messenger is going to be the right fit for you. First things first, before we start delving into all of WhatsApp’s much-lauded features–you’ll need to make sure that your mobile device is compatible with the WhatsApp application. If you’re using an iOS, Android, or Windows Phone device, then you’re automatically good-to-go, since these three mobile operating systems are universally supported across all devices that are running them. WhatsApp is also compatible with Blackberry, the Nokia S40, and the Nokia Symbian. If you’re not on any of these platforms, however, you won’t be able to run WhatsApp. Likely, since Android and iOS take up such a massive amount of the smartphone consumer base in the US, I’m going to bet that you’re using one of those. Additionally, while we’re going to focus primarily on WhatsApp’s features and functionality on your mobile device, there is a Windows version of the WhatsApp software that will run on your Windows computer. 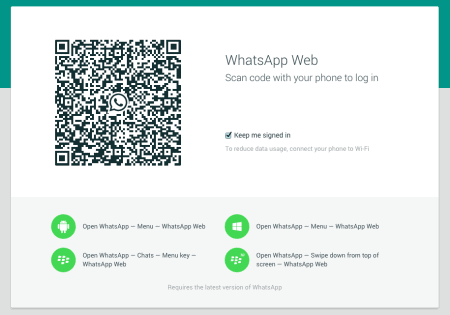 Aptly titled “Whatsapp Web,” this will give you access to all of your contacts from the comfort of your desktop or laptop. However, you must have a registered WhatsApp account in the first place before you’ll be able to run WhatsApp Web. This means starting out on your smartphone. No matter which mobile operating system you’re currently running, your first stop is going to be your device’s app store. Alternatively, if you’re reading this from the comfort of your smartphone, you can follow the links available here to access the download link more directly. WhatsApp is free to download and free to use, subject only to the amount of data that it occupies on your mobile device’s monthly data plan. Therefore, you should have an easy time both locating it and installing it on your device. Once you’ve done so, locating the application and open it up! Getting started with WhatsApp is remarkably simple, mostly thanks to the fact that your profile will be tied to your mobile device (and therefore, your mobile phone number.) You’ll be asked to provide your name, but your phone number should already be detected by the app from the moment that you open it. Since WhatsApp is tied to your specific number, security is dependent upon you retaining the mobile device. The first thing that you need to know about WhatsApp contacts is that they must already be a contact in your device’s address book, without exception. In this way, WhatsApp ties much more intricately to your day-to-day calling and messaging activities than other communication apps of its kind, that keep their own, separate contact lists. Additionally, any contacts in WhatsApp must also have the application installed on their respective devices. There’s no way around this, and therefore, it’s beneficial to get as many friends onboard with the app as you can! When you first download and install WhatsApp, you’ll be given a prompt to allow WhatsApp to access your contacts. Since there’s very little benefit to keeping it from doing so, you should allow it do so. Any contacts that aren’t added through this method can be added to your WhatsApp list manually. Even when you’re doing this, it will all be contingent upon how that contact appears in your device’s address book. WhatsApp constantly refreshes its access to your device’s contacts in order to give you access to as many friends on WhatsApp as possible. In the case that a friend isn’t showing up in WhatsApp, make sure that that they have the app installed, and also that you’ve entered their phone number correctly. As long as you haven’t exceeded the cap on your mobile device’s data plan, WhatsApp messages are free to send. Though most mobile service providers allow free and unlimited texting as part of their offerings, any messages that consume data will eat away at your data plan. The benefit provided by WhatsApp is its ability to send messages to other WhatsApp users by using data rather than cellular service. For example, if you have access to a Wi-Fi connection, you’ll be able to send messages and make calls between your WhatsApp contacts without using one bit of your paid cellular data plan. Essentially, your messaging and calling becomes free. The only exception that you’ll phase is if you send SMS messages to your friends that aren’t on WhatsApp. Once they’re onboard, you’ll be able to use the app to communicate with them as normal, but until they are, normal SMS messaging rates will definitely still apply. This can be especially beneficial when you’re communicating with someone across long distances, even if they’re in a different country. Since you’re using an online connection for your messaging and calling, normal cellular and phone communication barriers won’t apply. Is your friend traveling abroad? If you’re both connected to a Wi-Fi network and using WhatsApp, you’ll be able to talk without any additional charges or outrageous fees for international calling. While WhatsApp doesn’t currently feature video calling, we know that it’s coming. Leaks from internal testing and barebones previews offered by the WhatsApp team have set aside much of the mystery and confusion, and all that we have yet to know is when it will be arriving. As one of the newest and greatest trends in communication, video calls allow users to do more than just send clips back and forth to each other–you can actually speak in real-time, watching the respective recipient of your communication through your mobile device’s camera. Why is this such an important feature of WhatsApp? Because of the free aspect of its calling and messaging services. When you’re not using a Wi-Fi connection, video calling can thoroughly devour your available data. Since WhatsApp allows you to make calls and send messages using an online connection, instead, we can only assume that its video calling will also take advantage of this. Every benefit stated above about communicating with friends over long distances, or even in other countries? It’s safe to say that we’ll be able to extend those to video calling as well, which will only ever help to bring people closer together. While we don’t yet know the exact release date of WhatsApp’s video calling, we know that it’s on the way, it’s currently being tested, and it’s going to be well-received when it finally arrives. In the meantime, you can certainly record and attach video clips to your WhatsApp messages. Another recent addition to the WhatsApp arsenal is WhatsApp Web, a portal that gives you access to every feature of WhatsApp from your Windows desktop or laptop computer. Everything you need to access it can be found here, and thankfully, there’s very little setup involved beyond what you’ve already done to get yourself started in the mobile app. Follow the above link, or go to http://web.whatsapp.com. On your computer, you’ll be presented with a QR code. Time to switch back to your mobile device! In your Settings menu, select WhatsApp Web. This will activate your device’s camera. Next, use your mobile device to scan the QR code presented by the WhatsApp website. In a brief few seconds after having done so, your phone will now be tied to the WhatsApp web portal! You won’t be required to install any software on your computer, but you will be required to tether your phone to the portal should you ever try to connect it to a different computer. Additionally, your phone must remain within proximity of the computer you’re using WhatsApp Web on in order to maintain the connection. It’s a handy feature, but your mobile device and your computer have to be cozy peas in a pod in order for it to work! This is only a taste of what this popular app has to offer, but it’s hopefully enough to get you rolling! Considering how accessible WhatsApp has become in the past several years, it’s equally remarkable that the app has managed to remain completely ad-free, resulting in a uniquely streamlined experience. While other apps are often bogged down by third-parties running ads, WhatsApp is quick and clean. If we missed anything in our priming guide to WhatsApp Messenger, chime in and let us know your thoughts in the comments below!